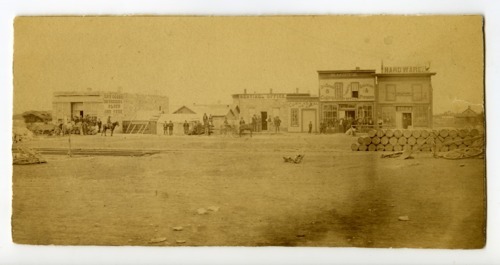 This sepia colored photograph shows the storefronts in Hays, Kansas. The business shown include two dry goods store, the Sentinel newspaper office, a feed store and a hardward store. The following information is on the back of the image: "first Sentinel Office, same site as photograph of 1875, Father Montgomery tallest man left of door. Frank Montgomery at right of door, foot on window sill. S. Motz without hat in front of his store. Wilson's corner store on left."